RAMMSTEIN returns! 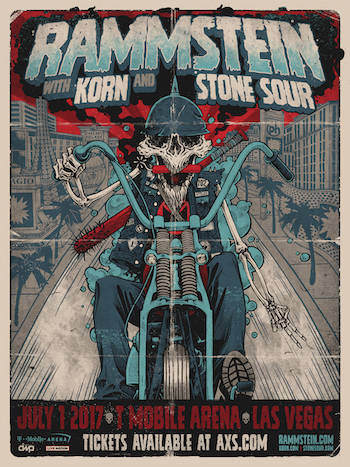 The iconic German metallic industrialists, known for their pyro-maniacal live performances, are throwing down with the legendary KORN and STONE SOUR July 1st for a very special and exclusive one-night-only event at T-Mobile Arena in Las Vegas. Tickets for this Independence Day weekend extravaganza, produced by Danny Wimmer Presents and Live Nation Las Vegas, will go on sale beginning Friday, March 31 at 12pm PT and will be available at www.AXS.com. Tickets start at $49.50 and special VIP upgrades will also be available for an additional $99. VIP upgrades include a custom event poster, dedicated entrance to the venue, access to a VIP-only lounge at Hyde, a commemorative laminate and a commemorative patch. "Vegas is known to push the limits, and this will be a night of over-the-top experiences. This show is going to be a wild night and a great way to add some fireworks to your 4th of July weekend," said Danny Wimmer, founder of Danny Wimmer Presents. The triple-threat potency of this bill brings three-and-a-half hours of all the fire-breathing rock 'n' roll glory Sin City can handle to T-Mobile Arena. This is the chance to catch Rammstein in top roaring form, playing one of only a few scheduled U.S. shows in 2017 — and their only show with Korn and Stone Sour. Korn is hitting the road this spring in support of their critically lauded latest studio album, The Serenity of Suffering, released last October. The track "A Different World" features a guest appearance from Stone Sour (and Slipknot) frontman Corey Taylor. Stone Sour are hot on the tour grind in anticipation of their upcoming album Hydrograd, due this June on Roadrunner Records. With the record out in the world weeks before this show, fans are all but guaranteed to catch some of the band's strongest new material — which Taylor has promised is "the best album we've ever done." Rammstein's new documentary, Rammstein: Paris, is screening in over 1,000 cinemas in 46 countries. The film was shot in March 2012 at the Accor Hotels Arena in Paris during Rammstein's "Made In Germany" tour, and was helmed by longtime collaborator and esteemed Swedish director Jonas Åkerlund. The band is also reportedly working on new material, and has been performing a new song, "Ramm 4," a tribute to their past material, at live shows this year. T-Mobile Arena, the new 20,000-seat venue located on the Las Vegas Strip between New York-New York and Monte Carlo, opened April 6, 2016. The arena will host more than 100 events annually including major headline entertainment, awards shows, UFC, boxing, basketball and other sporting events, family shows and special events. T-Mobile Arena will welcome a National Hockey League expansion team in the fall of 2017 — Las Vegas' first professional sports team. The city's newest landmark features 50 luxury suites, more than two dozen private loge boxes, complete broadcast facilities, and other specially designed exclusive hospitality offerings and fan amenities destined to create a guest experience second to none. Toshiba Plaza, an adjacent two-acre outdoor entertainment space, features performance stages, a variety of video screens and other interactive content and display areas. Industry-leading architect Populous designed T-Mobile Arena to meet the U.S. Green Building Council's standards for LEED® Gold Certification. T-Mobile Arena is a privately funded joint venture between AEG and MGM Resorts International (NYSE: MGM). For more information, visit the T-Mobile Arena website at www.t-mobilearena.com.